Whether for public or private use, historic structures are important parts of our communities. Owning and maintaining a historic building, however, can bring unique challenges. But with a little planning you can keep these problems from growing into , full blown disasters. 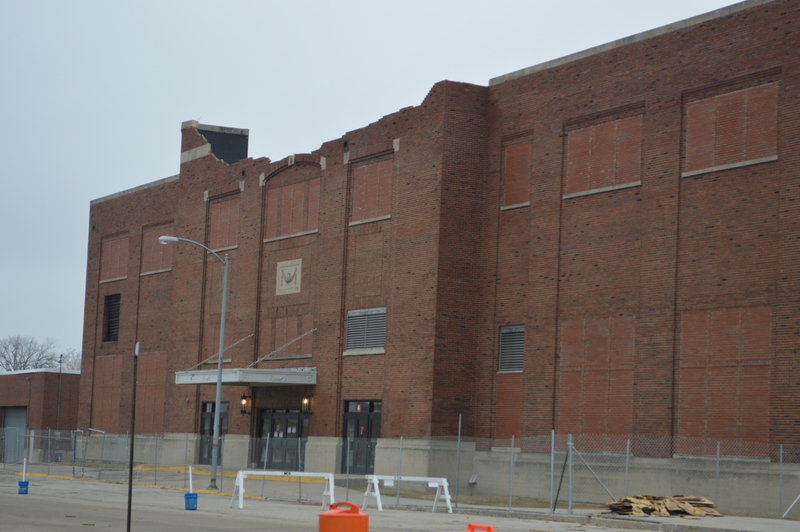 The City of Muncie, Indiana recently experienced a storm that severely damaged the historic Muncie Fieldhouse. Built in 1928, the fieldhouse has been the center of the Muncie community for generations, but due to budgetary issues, maintenance and care had not been able to keep up with the needs of the building, leading to larger structural problems. Now, the damage from the recent storm is so severe that the future of the fieldhouse is in jeopardy. Losing the Muncie Fieldhouse would be a significant loss for the community. The historic Muncie Fieldhouse – after suffering recent storm damage. Getting the community involved and excited about your historic property is a great way to help raise funds, create allies, and find resources to help you with your building. There may already be a group that values your building. You may just need to look around and connect with them. Some of these groups might be your local historical society, town historic preservation commission, or a local university. All of these would have expertise and resources to help you maintain your historic property. Another way to fund upkeep for your historic property is to crowdsource funds. There are many effective ways to involve interested parties and raise funds. By creating a goal and stating your purpose, you can connect with people who value your project and want to help fund you. Through this you will involve others who can help raise the money you need for larger projects. Finding the funds for larger maintenance needs can be difficult. But there are numerous grants available to help with historic preservation projects, such as building rehabilitations and reconstructions. Grants come from a variety of sources and have various requirements. You can apply for these grants on your own, but you may wish to consult with a professional architectural historian, who can help you determine the best course of action in pursuing grants for your historic building. An architectural historian would also be able to help navigate the language and complexity of these historic preservation grants. Regardless of your funding sources, it can help to contact an architectural historian. Even a brief discussion may help clear up some questions or help point you in the right direction. A more developed and professional relationship can help you research your historic property and learn about its original use and significance, or help determine eligibility in the National Register of Historic Places, which in turn opens more grant possibilities and provides some legal protection for your property. An architectural historian can also help apply for historic properties tax deductions. If you have access to a professional, they can help you better understand your historic property, guide you through maintenance projects, and help you prepare for the future upkeep and preservation of your building. It can be more expensive to preserve and maintain a historic structure compared to a modern building. This is largely due to more frequent repairs, or the need for skilled specialists familiar with the unique materials and problems of historic buildings. Admittedly, gathering the funds and expertise to maintain a historic building can be a daunting task. While the frequency and types of repairs may be different than what you are used to, staying on top of the day-to-day upkeep of a building can help avoid a major issue that will take you unaware or unprepared. The cost and commitment to larger projects is frequently so daunting that projects are postponed until there is more money and time. But often the resources and right time never come. Simply feeling overwhelmed by a large historic property can also make it difficult to begin. But indecision will almost always lead to small problems becoming larger problems, and larger problems leading to unexpected disasters. Seeking out community involvement through interest, resources, and funding, and applying for historic preservation grants are good ways to meet your goals of maintaining a historic property. If you need additional guidance, an architectural historian can help you establish a course of action, find the resources you need, and achieve your goals in maintaining and preserving your historic building. Forearmed with these ideas, it is possible to avoid disaster.